Some Company in association with bAKEHOUSE Theatre Co presents, LEAVES, by Lucy Caldwell, at the Kings Cross Theatre (KXT), Kings Cross Hotel, July 9 – July 23rd. LEAVES is a play by Irish writer, Lucy Caldwell, written in 2007, as part of a residency at the National Theatre Studio. A family is waiting for the return of their eldest daughter, Lori (Harriet Gordon-Anderson), from a recovery clinic after an attempted suicide. Her two younger siblings, Clover (Bobbie-Jean Henning) and Poppy (Poppy Lynch) have responded to the events differently and are trying to find a way to prepare to respond for when she returns. Her parents, David (Simon Lyndon), and Phyllis (Amanda Stephens-Lee) are devastated and bewildered by what has happened. The play is set in Belfast, Northern Ireland, and in the times of its great political unrest (The Troubles) and deals with the consequences on the psyche of those caught-up in a world at war with itself. The play, in the words of Rachel Chant in her Director's Notes, "...isn't a play about suicide..." or "...about the bombs or shootings..." but about "our capacity for hope." The play has a kind of Chekhovian feel of closely observed human relationships. The quirks of emotional maturity and the individualistic natures within a family are detailed with a delicateness that gently draws one into their dilemmas. The first act is a slightly over-extended 'Waiting For Lori - (Godot)' to return, and the play does not really take off until the second half with a beautifully realised scene between the three sisters. 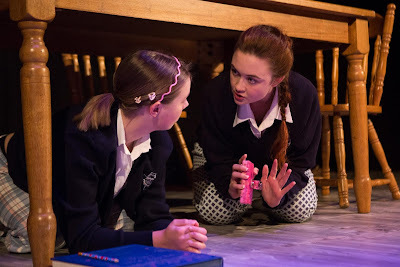 Ms Henning and Lynch are especially convincing and ultimately moving as the two younger sisters, Clover and Poppy. Mr Lyndon, doesn't quite fill out the opportunities of the sparely written character of the father, while Ms Stephens-Lee, plays the mother character with a little too much surface - obviously. Ms Gordon-Anderson plays the depression of Lori well, but, relatively, fails to play the contrasted opposite that Ms Caldwell gives opportunity for, in the last scene of the play for us to be moved in the intended way. Ms Chant, the Director has, mostly, nurtured the musical structures of the writing, although, the mood and tempo of this production's last scene, which is really the first scene in the chronology of the story, suffers from a kind of hangover of all that we have sat through, instead of the contrasted optimism and excitement of the beginning of an adventure into a new life in a new country, as the family prepares to launch Lori, with presents and champagne, off to her study in England. There is an authorial echo from Ms Caldwell of the J.B Priestly juxtapositional juggling with his play's time structures in the famous TIME AND THE CONWAYS (1937). The Design, Set and Costume, in the traverse set-up of this theatre's playing area, by Isabel Hudson, is beautiful, complimented by the uncredited Lighting Design. The Compositional work by Nate Edmondson, is mostly stimulating, but occasionally over plays the emotional context of the story - manipulating us a little too obviously, where subtle underscoring would probably be more effective. I saw LEAVES at its second preview. I have always liked the play and with a little patience through the first act was rewarded with a pleasant experience with this gentle play.